The rapid development of modern technologies, like artificial intelligence (AI), the Internet of Things (IoT), cloud computing and big data has irrevocably changed the operational principles of modern businesses. In the era of Industry 4.0, digital and traditional technologies are being interwoven at an unprecedented scale. It’s only those companies that are able to embrace and implement these new technologies in their operations that have the chance to maintain continued growth and remain competitive in the market. Embracing the digital transformation is key to success, a fact confirmed by respondents to Deloitte’s survey on The Industry 4.0 paradox. 94% of those polled consider digitization as a strategic goal in their organisation. The same Deloitte report shows that only 68% of respondents see digital transformation as a means to increase the profitability of their business. This disproportion illustrates a basic problem with understanding digitization: to fully benefit from its technological advantages, you must do more than simply automate some business processes. Change must permeate throughout the organization’s culture and corporate governance, with particular attention paid to the function and obligations of IT and how they interconnect with other departments. In the fast-paced environment favored by modern entrepreneurs and start-ups, the relevance and even survival of IT departments depends on how well their relevance, capabilities, and usefulness are understood. Organizations need specialists who are able to efficiently respond to changes in business processes, and to provide new and updated applications to support them. At the same time, they also have to ensure the continued operation of business critical systems. Gartner has identified a response to this great challenge in digital transformation: the concept of two-speed, or bimodal IT. In larger organizations, departments reporting to the Chief Information Officer (CIO) should be able to work simultaneously in two modes with differing goals: performance and reliability and agility. The first involves caring for the so-called technological core of the company, which Gartner calls the Systems of Records in the Pace-Layered Application Strategy model. This category includes all solutions, from infrastructure to business applications, that ensure the stable continued operation of the company, and serve as the foundation for the implementation of innovations. The second mode of operation in bimodal IT is considered the “child of digital transformation”. In this mode, IT focuses on prompt and often iterative delivery of innovative solutions following the concept of Rapid Prototyping. They work in close contact with business users, smoothly and quickly responding to changing internal needs and signals from the market. Rapid change and flexibility is possible thanks to the use of modern tools, like the agile methodology, DevOps paradigm and no-code/low-code Rapid Application Development (RAD) platforms. Gartner predicts that by 2020 at least 50% of new LOB (Line of Business) applications will be developed via RAD platforms. It is worth noting that neither of the operating modes used in bimodal IT is able to, on its own, fully satisfy all the needs of the modern enterprise. With a focus on performance and reliability, you cannot also expect to be flexible and easy to change, while an agile approach cannot succeed if it is to focus on technological requirements related to security or performance. The concept of two-speed/bimodal IT sees simultaneous and equal-value work in both modes to maintain, support and develop business. For an IT team to fully benefit from digital transformation and redefine their style of operation, they need a manager to act as a guide through the world of modern technologies. For years, IT directors in companies have been perceived as stabilising agents. Their tasks included maintaining the operating order and the provisioning of IT solutions that ensure efficient, effective and cost-optimized work across departments. As indicated in Deloitte’s “CIO Survey 2018. Looking beyond the digital era” report, this type of “trusted service provider” manager is gradually becoming a thing of the past. The top two expectations of a CIO in this survey were the ability to adapt to business strategy and process transformation. Ensuring the effective operation of IT only came in third. This change in approach is clearly a result of the ongoing digital transformation. In the age of digitisation, IT departments and their managers must change the perception of their role in the organisation, and look at IT as an equal partner in business. 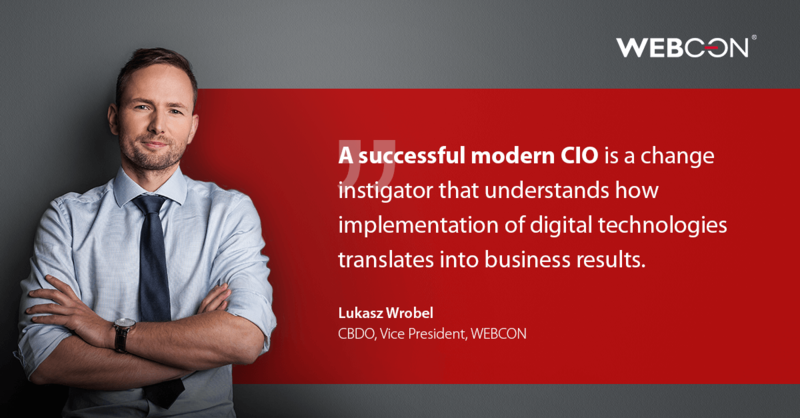 A successful modern CIO is a person who understands the interconnection between the implementation of digital technologies and business results: uses digitization to build competitive edge, enhance business processes, increase the involvement of employees and clients, and generate valuable new business models. Naturally, the development and maintenance of stable systems that efficiently handle key processes in the enterprise are, and will continue to be, the priority for IT departments. However, in the digital era where business strategy and technology are inseparable, it will be expected of CIOs to combine the traditional role of service provider with the position of change agent and business partner. According to 70% of respondents in the Deloitte Survey, it is the CIO who is expected to play a key role in managing and implementing digital ideas, exceeding even that of the CEO who got 61%. IT departments must be open to sharing knowledge about technological trends. Their tasks will include supporting management in setting strategic priorities for innovation, and they will be responsible for the active implementation of good practices by providing flexible business applications that can quickly be adapted to ever-changing needs. This extension of duties will require the development of new soft skills and, according to CIOs, the most important of those skills are the ability to influence, an aptitude for identifying effective solutions to improving business processes, and getting in the habit of constantly acquiring new knowledge (so-called lifelong learning). The times when the IT team was only expected to responded to business needs are long gone. In the era of the digital transformation, IT is expected to participate in the creation of new products and business applications at every stage: from conceptualisation, design and development to testing, implementation and maintenance. Such interdisciplinary cooperation with various departments in the company requires not only knowledge and professional experience, but also the development of skills that have not been discussed in the context of IT before: what we call soft skills. This trend is confirmed by the respondents to the “CIO Survey 2018. Looking beyond the digital era.” When asked about the most desired soft skills for IT employees in the next three years, they point to creativity, cognitive flexibility and emotional intelligence. At the same time, they believe that there will be a drop in the importance of service orientation, critical thinking and problem solving. According to the EY report “Global generations: a global study on work-life challenges across generations”, by 2025 75% of the global workforce will be comprised of millennials. These people have been raised and surrounded by modern technologies which solve a myriad of problems, not just business-related ones, and where applications are used every day. This generation of workers is attracted and retained only by those companies where the organisational culture is closely tied with modern technologies, while offering flexible hours and a creative environment that motivates them to constantly improve their qualifications. These companies are the definition of organisations that have done their homework on implementing the digital transformation. They do not have to worry about acquiring and retaining computer science talents. The analysis of the current labour market leads to the inevitable conclusion that retention of current employees is just as important as hiring new ones. The study “Poland forms an ideal workplace” conducted by the Employer Branding Institute and EY leaves no room to argue. With a national unemployment rate of 5.7% and rising salaries, 60% of Poles are dissatisfied with their job. This dissatisfaction is particularly clear in the IT sector, where turnover has been very high for years. If companies want to improve job satisfaction and lessen turnover, they must intensify focus on the employee experience. This means looking at your company through the eyes of your subordinates, and improving the situations in their everyday work lives that are not satisfactory for them. The Forrester research agency estimates that in the next year, the rapid growth of artificial intelligence, automation and robotization (Robotic Process Automation) will result in at least 1 in 10 newly-founded start-ups to employ more so-called “digital employees” than humans. Should we worry? The hypothesis that robots will replace man at work should be left for science-fiction enthusiasts. The automation of processes and AI are only there to relieve employees from tedious and repetitive tasks, allowing them to focus on more ambitious goals. For example, business process management platforms use artificial intelligence for things like quickly scanning the contents of a document, workflow analysis, and the automatic identification of bottlenecks that need improvement. Automation, particularly in the IT department, offers computer scientists and other IT professionals with more possibilities to use their creativity. With less time spent on developing typical business applications, employees are free to create specialized and dedicated solutions, algorithms, novel information and system architecture management strategies, and engage in true innovation. These technologies, when combined with interesting development prospects, increase an employee’s emotional investment in their work, creating a positive employee experience and helping prevent turnover. Another related technological trend that will be hugely popular in the next year involves centralized coordination and automation centres. Forrester predicts that by the end of 2019, 40% of enterprises will have these automation centers and frameworks in place. Following best practices on technical compatibility and process integration, they will make decisions on how to best apply automation to solve problems faced by businesses. Klaus Schwab, founder of the Economic Forum in Davos, writes in “The Fourth Industrial revolution” that in order to understand the era of Industry 4.0, it is necessary to transform humanity [because], in its scale, scope and level of complexity, the fourth industrial revolution reminds us of nothing that we, as people, have been dealing with so far. The technological trends that will dominate 2019 are nothing less than a confirmation of this thesis. If we look closely at the concept of two-speed/bimodal IT, the changing role of CIOs in companies, the greater emphasis on lifelong learning and development of soft skills, and advancement in automation and AI, it turns out that man is still at the center of the digital transformation, and that modern technologies may make their life easier in the constantly shifting reality.